Outcast has been created from great ideas and technologies. From the game engines to the artificial intelligence and the orchestral score; Every piece of the puzzle will deliver this amazing game to you, the gamer. Outcast‘s graphics engine is mainly a combination of a ray casting (heightmap) engine, used to render the landscape, and a texture mapping polygon engine used to render objects. The “Engine Programming” section of the credits in the manual has several subsections related to graphics, among them: “Landscape Engine”, “Polygon Engine”, “Water & Shadows Engine” and “Special effects Engine”. Although Outcast is often cited as a forerunner of voxel technology, this is somewhat misleading. The game does not actually model three-dimensional volumes of voxels. Instead, it models the ground as a surface, which may be seen as being made up of voxels. The ground is decorated with objects that are modeled using texture-mapped polygons. When Outcast was developed, the term “voxel engine”, when applied to computer games, commonly referred to a ray casting engine (for example the Voxel Space engine). The engine is purely software-based; it does not rely on hardware-acceleration via a 3D graphics card. Outcast features effects such as character shadows, depth of field, bump mapping and reflections. Anti-aliasing is used to smooth certain texture boundaries. The heightmap engine renders reliefs with self-occlusion, motion parallax, and silhouettes (but no shadowing)–even for details such as cobblestones. Water surfaces appear both translucent and reflective. The surface appears to reflect the environment (the skybox) and appears rippled with moving waves, which react to the character’s movement while in the water. The degree of translucency depends on the viewing angle. The more vertical the angle, the clearer the water appears while the more horizontal the angle, the stronger the reflections. Other visual effects include bloom and lens flares, falling snow, fire, and other glowing particles. The disadvantage of this type of CPU-intensive software-rendering was that Outcast required an extremely powerful CPU (nothing but the most powerful Intel Pentium III processors of the time, in the 500-600 MHz range) and massive amounts of RAM (128 megabytes were recommended) to run at full speed and maximum resolution (512×384). However, these considerations can now be safely ignored, as even low-budget PCs of today significantly surpass those requirements, even to the point that additional software is needed to make the game slow enough to be played. The AI used in Outcast was considered revolutionary at the time it was released. It was based on a proprietary engine codenamed GAIA, for Game Artificial Intelligence with Agents, which was composed by a set of C++ libraries that provided sophisticated control of game characters based on research in distributed AI. Intelligence is represented as a distributed activity over a set of autonomous routines called agents. An agent uses skills, such as hearing, sight, acrobatic, to complete assigned tasks. These agents can interact and even compete with each other to realize a complex task. Outcast features a high-quality orchestral score composed by Lennie Moore and performed by the Moscow Symphony Orchestra and choir. 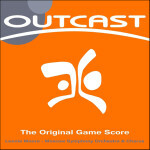 At the time of Outcast’s release, orchestral game scores were uncommon, and Moore’s achievement was hailed as “absolutely top-notch”. The game’s publisher Infogrames released the hour-long score on a soundtrack album and it was later made available for MP3 download on the game’s official website. Anyone who owns the original game can listen to the soundtrack by putting disc 2 into a CD player. Below you will find the English voicecast of the game.